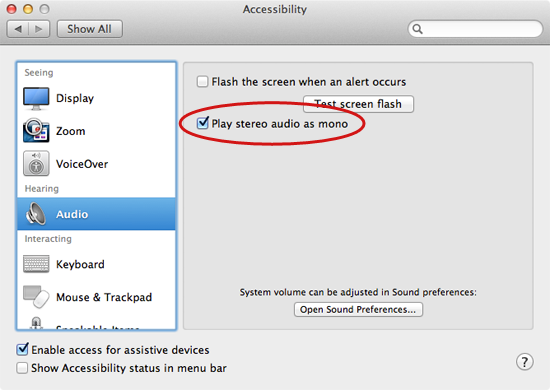 Fortunately, there's an easy and temporary way to convert your Mac's stereo output to mono. Converting to mono will combine the output of both channels so that you'll hear the same audio in both ears. This usually results in substantially lower sound quality, so it's not a feature that you'll want to leave enabled all of the time. From the sidebar, select Audio. The window shown below appears. Select the Play stereo audio as mono checkbox. Now you'll be able to hear music in both channels - a welcome relief for those of you listening to bad tracks with high-quality headphones. To switch back to stereo output, just deselect the Play stereo audio as mono checkbox.